I was searching through the MR and Train DVD collections doing research for a book project. As I flipped though an issue looking for something else, this photo filled my screen. "Hey, I recognize that! ", though in truth I forgot about it. This was a photo submission for a MR Photo Contest that did not win. But it did appear in Trackside Photos. Michael Bencs owned the locos. I borrowed them for the photo shoot. The bushes were Supertree sprigs, a new product at the time. A different photo from that diorama did get third place in the photo contest. I have the MR and Trains DVDs. They are well worth the purchase price. The search engine that comes with the DVDs is not very good, but you can use the Model Train Index on the Kalmbach site to help with searches. It is a lotos fun to read MR from the 1930s and 40s. Stories about guys scratch building locos with a almost no tools in war zones, and some sophisticated layout designs. Very cool. 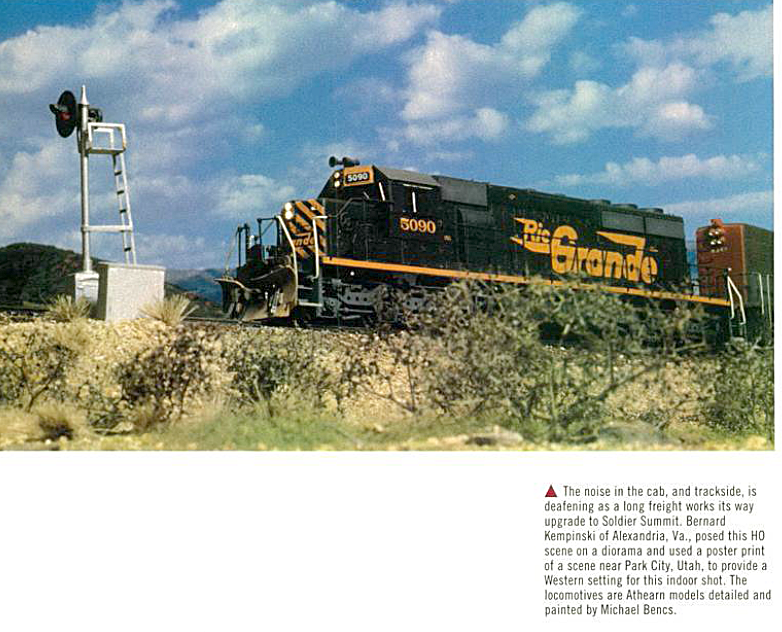 Trains Magazine's early issues are pretty crude compared to today, but the info is there. Here is a neat story that popped up in my searches. I and heard about this bridge, but never saw any pictures. There was another article that discussed the railroad that served the Washington Navy Yard. It is all gone now, but at one time there was a pretty incredible railroad operation there. Marty and I recently had a discussion about model railroads and happiness. Without getting into his specifics, which I am sure he will blog about at some point, we came up with this Happiness versus Layout Complexity graph. Many model railroaders assume the red line is the approach to happiness. Bigger is better. Others insist that only a large complex layout allows them to attain happiness. They ride the blue line. Some people are never really happy regardless of what they build. Those are the yellow line folks. I suspect that most of us in the real world of commitments other than hobbies walk the green line. Yes, a layout can be too big. While you contemplate this, enjoy this cover rendition of the popular song "Happy" by the Canadian Group Walk Off the Earth and Parachute. Last weekend I attended the Middle Atlantic Railroad Prototype Meet in Falmouth, VA. Yes, that is the same Falmouth that is on my layout. This is an after action report from my participation at the show, not a full recounting of everything that happened. Overall it was a very good event. As the event grows it is likely to get even better with more clinics and models on display. The event took place over Friday and Saturday at the Wingate Hotel in Falmouth. It was a nice hotel. The rooms were nice, clean and up to date. They had a pool and exercise room. The meeting areas were spacious. The main lecture hall had excellent acoustics for the speakers, though it was hard for speakers to hear the audience's questions (at least I had a hard time). The hotel provided coffee and water all weekend, a nice touch. About 100-120 folks attended the event. Except for a slight overlap, it was definitely a different group than one sees at most local NMRA events. The average age was probably lower than at an NMRA event, but not by much. Nonetheless, it is good to see younger people getting involved in the hobby. I met a lot of new people as well as old friends. A group of vendors set up shop including the ACL Historical Society. The vendors seemed happy with the meet, but took down their stuff late Saturday afternoon, earlier than planned. Possibly because the show wound down quickly on Saturday afternoon. The clinics I saw were very good. I enjoyed them all, especially Ramon's talk, "Military Trains You Never Heard Of." Marty in his clinic, tried to blame me for "making him build a double deck railroad." Hmmm, that was not my memory of the sequence of events. I presented my clinic entitled, "The Model Railroad Goes to War." My talk got a late start as I went to dinner with a large group Friday night and it took forever to get out. Thus, I ran out of time at the end and could not finish the talk. I will do the talk again next weekend at the James River Division meet. Hopefully I will get through it then. 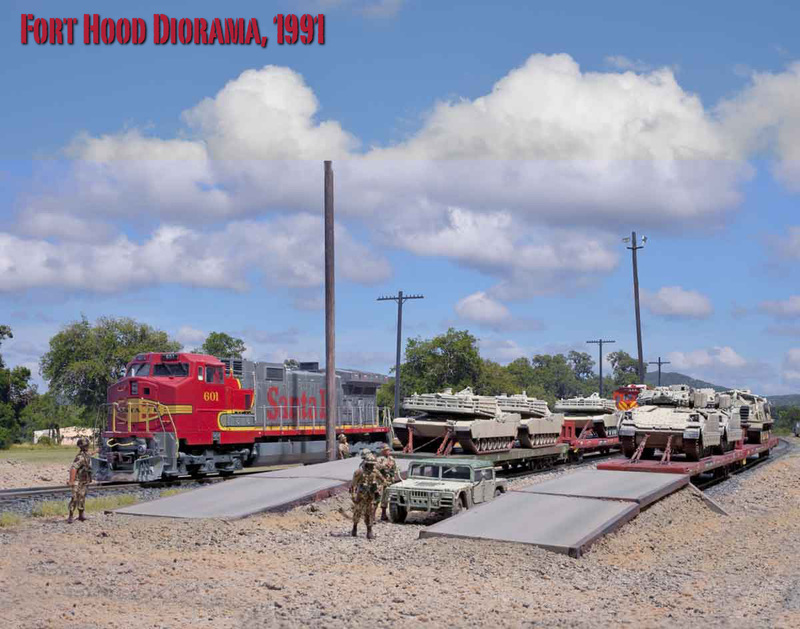 I brought my Ft Hood diorama to display. It seemed to get a positive reaction. The diorama is very easy to move around even if it doesn't fit in the Alkem HSRV (High Speed Railfan Vehicle.) I also had some of my Alkem Scale Models stuff on display, but I was not acting as a vendor. I had the pilot models of the new DODX Flat cars on hand and took reservations for them. They should be ready soon. There were a lots good models on display, but I forgot to get any pictures. Fortunately, Shannon Crabtree posted a bunch here. Some of the RPM guys bring a very military modeler mindset to the hobby. By this I mean they strive for exact replication of detail on their models. This is a good thing IMHO. I like going to these shows to see the hobby envelope being pushed. If a person can achieve this level of detail, and make a operating layout, then more power to them! The RPM also showcases a subset of modelers that specialize in realistic weathering. They achieve good results, especially considering they frequently use ordinary RTR out-of-the-box kits as starting points. On Sunday, after sinking a 76-foot putt for a birdie, I had a mini-open house for the Meet attendees. About 20 people stopped by to see the layout and eat some of AW's brownies. The layout ran great even though I didn't clean the track before hand. Battery power, baby! Gerry helped by running trains while I chatted with the visitors. I am looking forward to next year's meet. Hopefully, more of my layout, especially the harbor area, will be complete by then. Some of the visitors- John, Marco, Warren, Kim, Jeff, Ashley, Tom, and a smiling Gerry! I will be giving this talk Friday night at the MidAtlantic RPM in Fredericksburg. See www.marpm.org for more info. I will do it again the next weekend at the NMRA James River Subdivision in Richmond. More info here. If you can't make either of those dates, I will present it again at the MER Convention in October at Hagerstown. More info here. If you can't make any of these dates, the book will be available for sale on 1 Jaunary. One can pre-order it now via Kalmbach or Amazon. From the primitive 19th century iron horse to the thundering diesels of today, railroads have played an important part in enabling, changing, and sometimes inciting warfare. 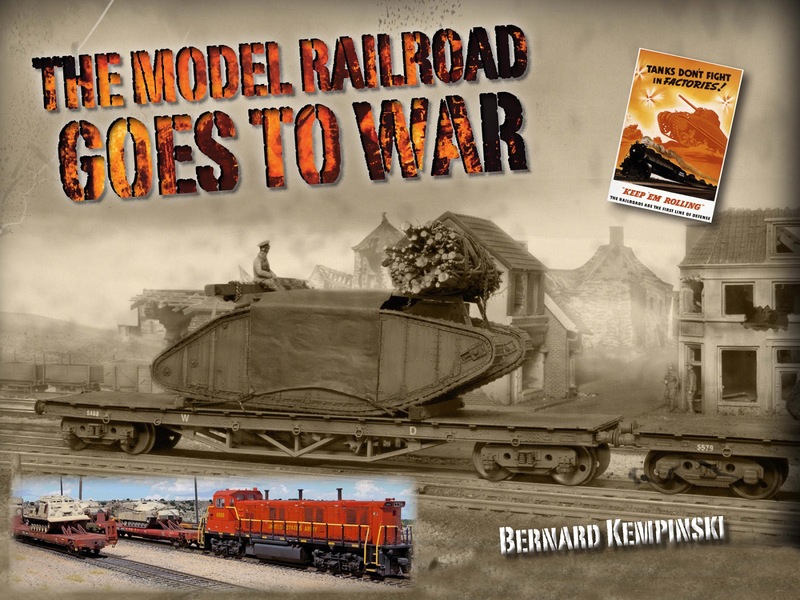 This talk is an overview of how railroads served in wars, and how to apply this information to design and build operating model railroads. Starting with the Crimean War in 1855 and extending to current times, the talk features protoype photos, maps and plenty of examples of world class modeling. It puts special emphasis on the US military in the American Civil War, WWI, WWII and Gulf Wars. Hopefully it gives you a better understanding of the role of railroads in warfare and acts as a tribute to the men and women that served. The past few weeks have been very busy here with lots of projects under way. The first bit of news is the pilot models of the photo etched HO scale model for the DODX 41000 series flat cars are ready. The pilot worked out well. There are few minor modifications to make and the car will be ready for sale. It includes photo etched brass, a laser cut acrylic core and 3D printed detail parts. In the meantime, work continues on the Lincoln Funeral car and the Thurmond coal dock model. If that wasn't enough work, I signed a new contract with Kalmbach Publishing to do a fourth book, tentatively called "45 Track Plans." This book will be a departure from my first track plan book because it will include many more track plans, but each layout theme will not be covered in as much detail as compared to my first book. The new book will tap my layout design notebooks from nearly twenty years of drawing designs for model railroads for railroads from Z to G scale. Over Labor Day Weekend, the Aquia Line had some more visitors. Today Dave Olsen visited. He is a Duke graduate mechanical engineer now an Army Major (soon to be Lt Colonel) with an Armored Cavalry background. He provided me with dozens of prototype photos of the DODX car. He is getting ready to deploy to Pakistan as a Military Liaison. I gave him a copy of the pilot model kit to help him pass the time and to wish him well. Yesterday, Joe and Carol Post, and Amy and Gary Spears visited. Amy and Gary are architects from Kentucky near Cincinnati. Gary comes from a long family of railroad men, mostly for the Southern Railroad. He quit school and worked as an agent operator for the L&N for a while. He decided he did not like it and went back to school to be an architect. He seemed to enjoy the layout, but advised me to play more golf!